Dusty (Dane Cook), the famous racing airplane, learns that his engine is damaged, so he must shift gears and find a new career. He joins an elite corps of firefighting aircraft devoted to protecting historic Piston Peak National Park. When a massive wildfire threatens the park, Dusty -- with the help of his fearless colleagues Blade Ranger (Ed Harris), Lil' Dipper (Julie Bowen), Windlifter (Wes Studi), Cabbie (Dale Dye) and the Smokejumpers (Regina King, Danny Pardo, Bryan Callen, Corri English) -- learns what it takes to become a real hero. But, surprise, surprise. 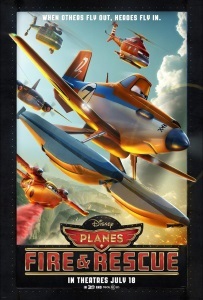 This "Planes" quickly grounds itself with a story that at least offers an emotional hook (if not ladder) that most adults and even kids can appreciate. Namely, the sometimes-fatal risks that firefighters regularly take for the sake of people they don’t even know. It all starts with a mechanical malfunction. Whereas Dusty’s Achilles’ heel last time was his fear of heights, now it’s his broken gear box (a sort of stand-in for a bad ticker) that is holding him back from reaching optimum speed. After a scare mid-flight while practicing his tricks for the local Corn Fest, the old-style single-engine prop plane must deal with the news that the part is no longer being produced and his racing days might be over. As he changes course by signing up to learn to be a forest firefighter at Piston Peak National Park, Dusty must once more temper his overconfidence and fears in order to succeed. More noted for the stunning scenery than the originality of the plot. This movie is better than it needs to be, and I really like it. This is my 4 year old son's favorite movie. He talks to everyone about it and is always surprised most people don't know the movie. I'm surprised too! It'll be interesting to compare this movie's "Champion coming to grips with his changing place in the world" with Cars 3's undoubtedly similar plot. Planes 2 had most of the same sexism and racism problems that the first movie had, only slightly toned down. Native American stereotypes. Two named female characters who fail the Bechdel test, one of whom is a weird, needy stalkerish character. My son watched it on Netflix or something. We didn't even bother showing my daughter. There was nothing here for her and precious little I want my son to learn. The visuals were okay. The animation was okay. Just okay. It was better than the first movie, but not by much. Much better than it needed to be. Also the Striker at the beginning quotes the correct sections of the CFR: "It's clear this airport has no plans for an emergency, and equipment from last century. So, unless Mr. Mayday gets refurbished, and acquires a second fire-fighting vehicle in accordance with CFR title 14, volume three, chapter one, section 139, sub-paragraph B, I am pulling this airport's certificate of operation for non-compliance of rescue and fire-fighting regulations."